So this is done so much easier than you would actually think. The picture above is done with a sugar cookie recipe – so use your favorite or you can even use store bought in a pinch. Allow dough to go to room temperature so it is easy to work with. As shown above the dough was divided into four equal parts (green, burgundy, orange, yellow). Use food coloring (paste or powder – do not use liquid it will change the recipe too much) and color each separated chunk of dough with a different color. Take chunks of dough off of each separated color and put on parchment paper covered counter with flour. Push down and put different colored chunk next to it until you get a nice array of colors. Use rolling pin and make cookies the thickness you desire. push cookie cutters down and make cookie shapes. Squeeze remaining dough together and roll out. The more you roll the more the colors will me mottled but thos can be a sweet treat just for you. 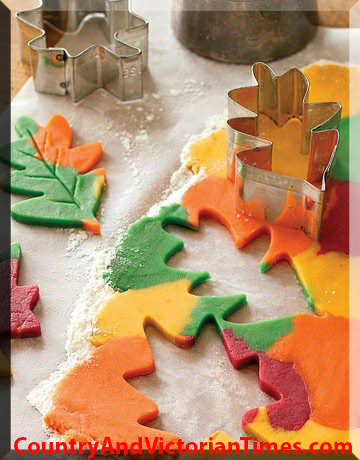 This entry was posted in Crafts ~ DIY ~ Projects, Recipes, ~Dessert, ~Edible, ~Holiday, ~Party, ~Snack and tagged cookie, Cookie cutter, cooking, desert, dinner, dough, Food coloring, Rolling pin, Sugar cookie, ~Halloween, ~Home, ~Party, ~Thanksgiving. Bookmark the permalink.